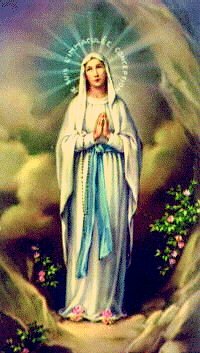 Our Lady appeared 18 times to Bernadette Soubirous, a young poor and sick girl in the grotto of Masabielle, close to Lourdes in France in 1858. She asked for a chapel to be built in the site of the apparitions and when asked who she was, She replied : " I am the Immaculate Conception "
Our Lady asked Bernadette to wash her face at the fountain but there was no fountain there, so Bernadette dug a hole in the ground, and with muddy water washed her face while people ridiculed her, however from there sprang the famous fountain of water that has healing attributes. Many sick people have bathed themselves in that water and there have been at least 64 reported miraculous healings. Millions of people from all over the world go to Lourdes yearly in the hope of obtaining help from the generous Mother of God. Bernadette became a nun, she died when she was 35 and her body is still incorrupt.